We can all be knocked back when stiff joints and aching muscles stop us from doing the things that we love. If you feel a walk to the park with a grandchild or colder evenings bring you to a halt, you need the MeTime Massage Hammer. With vibration-led massage, you will feel refreshed. Loosen up and relax with an invigorating tapping massage all over your body from the MeTime Massage Hammer. Provided with 5 interchangeable massage tools, you can easily target the waist, belly, thigh, back and shoulders with a relaxing, vibrating massage. It also helps to relieve joint pain and massage joints such as wrists, ankles and elbows. 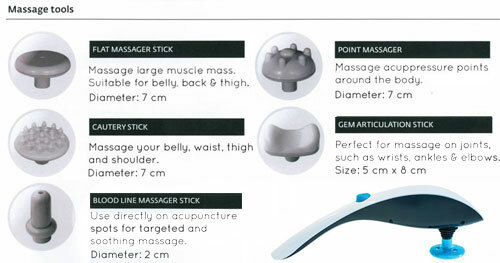 Tools include flat massager stick, point massager, cautery stick, gem articulation stick (perfect for joints!) and a blood line massager stick to pinpoint acupunture points. Each have a different function and are suitable on various bodyparts, but all will leave you feeling refreshed and relaxed. The Massage Hammer has different speeds and levels of intensity to choose from. It is easy to use and can help target acupressure points to relax muscles, helping you feel refreshed and relieving you of stress and fatigue. It is important to look after yourself, and that is exactly what the MeTime range is for. A selection of massagers that can penetrate different muscles and pinpoint acupressure points to truly relieve you of stress and pain. Perfectly combining the methods of classical massage, vibrations and modern technology, MeTime provides a therapeutic and stress relieving treatment from the comfort of your own home. Let your body feel rejuvenated by MeTime and feel great. For more in this fabulous range, click on the brand below.